Buttery Gluten Free Macadamia Nut Chicken Thighs are tender, meaty, and buttery rich in flavor. These will soon become a family favorite with their light crunch, and mildly tropical flavor. 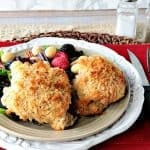 While this dish of Buttery Gluten Free Macadamia Nut Chicken Thighs may not be something you make and serve on a weekly basis, but for a special occasion, or as a dinnertime treat from time to time I hope you’ll add this dish to your recipe repertoire. I trust you’ll love it just as much as we do! 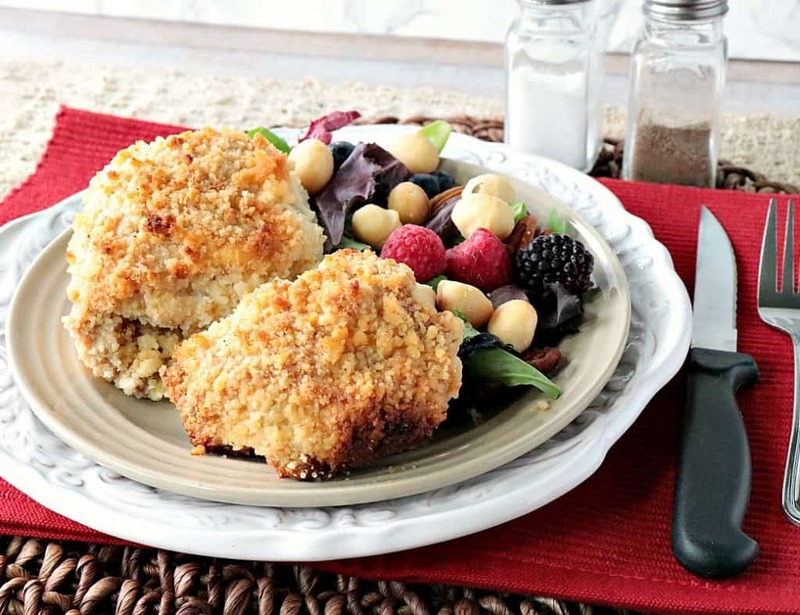 I purposefully planned for this recipe of Gluten Free Macadamia Nut Chicken Thighs to be a low carb option, so I used coconut flour instead of all-purpose flour in the macadamia nut coating. However, if you prefer to use all-purpose flour instead of coconut flour, I back your decision 100% and I don’t suppose it will affect the flavor significantly. **Please Note – The printable recipe card with detailed instructions and complete ingredient measurements for making Gluten Free Macadamia Nut Chicken Thighs is available near the end of this post. 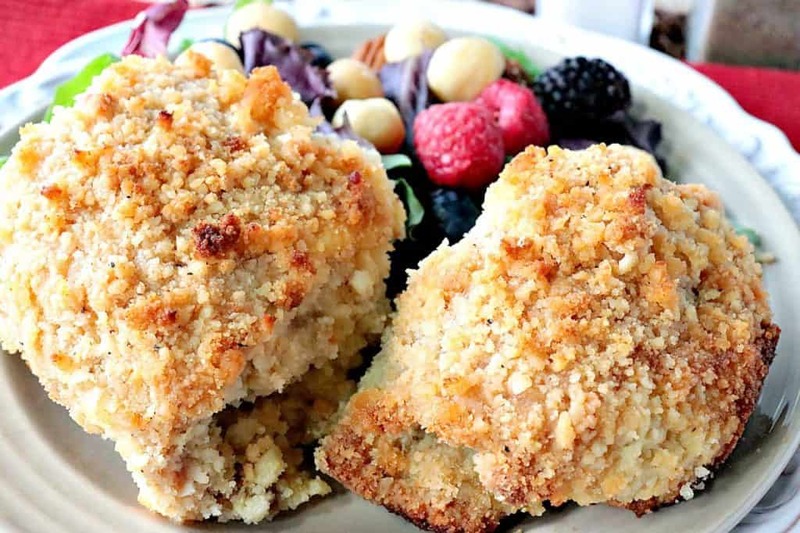 Making Buttery Gluten Free Macadamia Nut Chicken Thighs is as easy as 1,2, 3! Let me walk you through it! In a shallow pan, mix together the eggs, milk, salt and pepper. Pulse the macadamia nuts, flour, salt, and pepper in a food processor until it resembles coarse crumbs. Add the boneless, skinless chicken thighs to the egg mixture and flip to coat both sides. Add the nut-crumb mixture into a shallow dish and place the egg coated chicken in the macadamia nut mixture and press onto both sides of the chicken. Place the crumb coated chicken thighs in a large baking dish that has been sprayed with cooking spray. Drizzle the macadamia nut coated chicken thighs with butter and bake in a preheated 375-degree oven for 30 minutes, or until the chicken is golden brown and the juices run clear. The thighs and legs are always my favorite part of any type of poultry. To me, the dark meat is far more flavorful and tender than the breast. 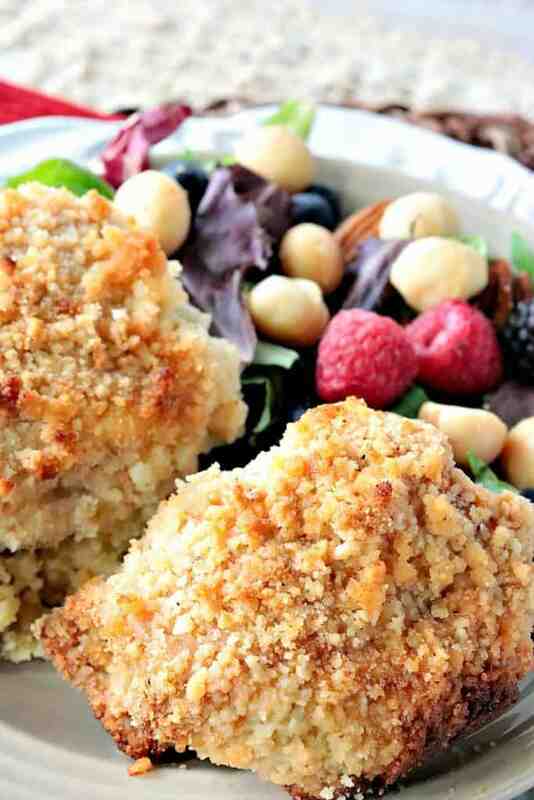 Gluten Free Macadamia Nut Chicken Thighs are tender, meaty, and buttery rich in flavor. These will soon become a family favorite with their light crunch, and mildly tropical flavor. Add the macadamia nuts and flour to a food processor and process until the mixture resembles coarse crumbs. Place the nut mixture in a shallow pan and season with 1 teaspoon of salt and ½ teaspoon of black pepper. Set aside. In a second shallow dish, whisk together the eggs, almond milk, ½ teaspoon salt, and ¼ teaspoon black pepper. Add the chicken thighs, 2 or 3 at a time, to the egg mixture, flipping to coat both sides. Add the egg-coated thighs to the macadamia nut mixture and press the crumbs onto each side of the chicken. Place the chicken in a baking dish that has been sprayed with baking spray. Sprinkle any remaining nuts evenly over the chicken in the pan. Drizzle the macadamia coated chicken with melted butter and bake in a preheated 375-degree oven for 25-30 minutes, or until the chicken juices run clear when pierced, or when the internal temperature reaches 165 degrees. I hope you’ve enjoyed this recipe for Buttery Gluten Free Macadamia Nut Chicken Thighs as much as I’ve enjoyed bringing it to you! 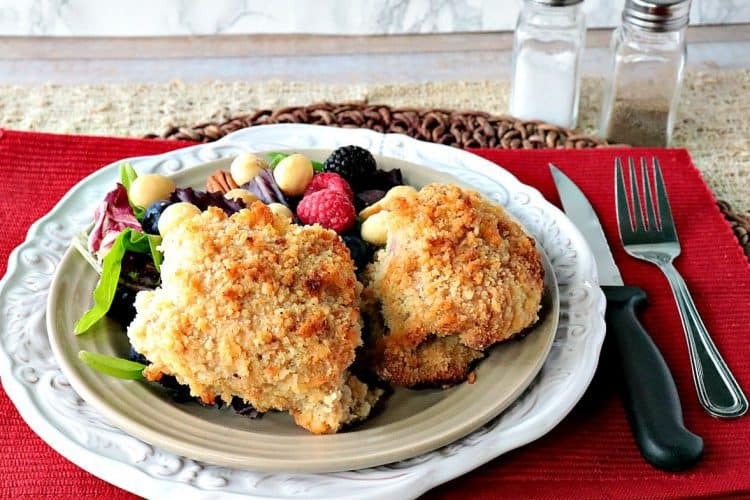 Should you have any questions regarding this recipe for Buttery Gluten Free Macadamia Nut Chicken Thighs, or anything else you’ve seen on my site, please don’t hesitate to contact me directly, or leave me a comment in the comment section below. It is always my distinct pleasure to get back to you with a reply just as soon as I possibly can!